Venus, our closest planetary neighbour (on average), has often been referred to as ‘Earth’s twin’, and not without good reason. Venus has a similar composition to ours, is roughly the same mass and, unlike the other inner planets Mercury and Mars, has a thick atmosphere complete with complex weather patterns and even rain. There are however very stark differences that make Venus an interesting contrast to our own planet: the atmosphere, for example, is not just thick but many times thicker than Earth’s and is composed almost entirely of carbon dioxide leading to a runaway greenhouse effect that makes Venus one of the hottest bodies in the solar system. The rains of Venus aren’t rains of water but of sulfuric acid and the planet is so hot that this acidic rain never even makes it to the ground before evaporating. While Earth has a strong magnetic field to deflect solar plasma and other interplanetary debris, Venus does not and is seemingly at the mercy of the solar wind. These differences make Venus a fascinating study of atmospheric conditions and for this reason, the topic of this paper is to answer the question “What and how do we know about atmospheric conditions on Venus and what challenges do these conditions pose for future missions?” It will start in the first part by exploring the mechanism by which planets generate their magnetic fields and the reasons why this mechanism doesn’t work on Venus. Then it will explore solar wind interactions with Venus’ atmosphere and the induced magnetotail resulting from these interactions and the electric wind phenomenon that contributes to atmospheric loss on Venus. In the second part it will explore how Venus manages to maintain an atmosphere far denser than that of Earth in the face of these phenomena with a specific focus on volcanic replenishment, atmospheric composition, and the surprising strength of its induced magnetic field. By understanding conditions on Venus, we can better understand how to further study the planet, and gain an understanding of planetary evolution. 1: Venus has no magnetic field. Why? How does this affect its atmosphere? 1. The planet must have a conductive fluid core. 2. The planet must rotate fast enough to cause sufficient flow in that liquid core. 3. An energy source is needed to keep the fluid in motion. For most planets, this is thermal energy and the motion involved is convection. 4. There must be a preexisting magnetic field to ‘seed’ the generation of a new one. These are the conditions needed to generate a magnetic field according to the dynamo theory or geodynamo theory, the most prevalent theory describing the origins of planetary magnetic fields. The basic mechanics are described by a variety of physical laws, including Maxwell’s equations, but the simplified process is as follows: First, as molten iron moves through an existing magnetic field (in this case that of the Sun) an electric current is induced in accordance with Faraday’s law. These currents, in turn, create their own electromagnetic fields (EM fields) which are kept in motion by a combination of planetary rotation and convection currents. Convection is simply the process by which the fluid in a planetary core is heated as a result of intense pressure and rises, then rises closer to the surface and cools, sinking back down to be heated again by pressure at the bottom, rising again etc. in a continuous cycle. By keeping the fluid in motion, the resulting EM fields are also kept in motion, constantly fluctuating, and this constant change, in turn, induces more current which in turn strengthens the EM field in a sort of feedback loop that results in a strong magnetic field (Fig. 1). 1.2: What’s missing for Venus’ dynamo? According to observations by the Pioneer Venus Orbiter which operated from 1978 until 1992, Venus has no intrinsic global magnetic field. The reason for this is not completely understood but if our current understanding of planetary magnetic field generation is correct, then it must be that Venus is missing one of the aforementioned crucial ingredients for sustaining a strong magnetic field. It’s generally accepted that Venus has an inner solid iron core surrounded by an outer liquid iron core much the same as Earth does so its core is fluid and conductive, satisfying the first condition. However, Venus rotates on its axis only once every 243 Earth days and this has been suggested as a root cause of its inability to sustain a magnetic field. In 1992 images of the Venusian surface obtained by the Magellan spacecraft were studied and it was concluded that the images strongly suggest a lack of Earth-like plate tectonics. The plate tectonics of Earth play a key role in cooling the mantle of our planet and it has been hypothesized that this lack of plate tectonics on Venus prevents the planet from cooling rapidly enough to drive convection in its core. So while Venus satisfies the first condition outlined above, we know it might not sufficiently satisfy the other two conditions. 1.3: Solar weather’s effects on Venus’ exposed atmosphere. Without an intrinsic magnetic field to divert charged particles, Venus’ atmosphere interacts directly with a large number of solar weather phenomena. Solar wind, for example, is a stream of plasma released from the sun consisting of electrons, protons, and alpha particles (helium nuclei) and these particles have energies in the neighborhood of 1-2 kilo electron-volts. Coronal mass ejections are another, much more energetic form of solar phenomenon with energies as high as 10 mega-electron-volts. For comparison, it only takes 13.598 electron-volts to strip the electron off a hydrogen atom, creating a hydrogen ion. This means that as solar weather interacts with a planetary atmosphere the constituent gasses are ionized, forming what’s referred to as an ionosphere. As a result of these interactions with solar weather there are a number of interesting effects on the Venusian atmosphere. While Venus may not have an internally generated magnetic field, its highly-charged ionosphere is capable of deflecting and diverting the charged plasma of the solar winds, effectively “draping” the magnetic field of the solar wind over the planet. This is referred to as an induced magnetic field. A similar induced magnetic field occurs with another type of unmagnetized body in the solar system: comets. The draping magnetic field due to interactions with solar weather is what gives a comet’s magnetotail its shape and indeed the same phenomenon gives Venus its own comet-like magnetotail (Fig. 2). The magnetic field lines cause the charged ionosphere of Venus to bulge and stretch in the direction opposite the sun much in the same way a comet’s does. This comet-like tail was observed by the Mariner 5 mission during the 1970s and ESA’s Venus Express further enhanced our understanding of this phenomenon in 2010 with detailed analysis of the solar wind plasma involved. The flow of ions in this magnetotail is thought to be a large contributing factor in the atmospheric loss of Venus. Various missions to Venus have attempted to gather data on its unique atmospheric interactions with solar weather but one particularly surprising discovery was made by the Venus Express mission according to research published in 2016. 1.4: The electric wind of Venus and its effect on atmospheric loss. During its mission between 2005 and 2015, the Venus Express analyzed electrons escaping from the Venusian ionosphere and found that they were traveling much slower than was previously expected. This meant that the electric field of Venus was much stronger than was previously thought. In fact, the electric field strength of Venus is at least five times higher than what was expected. The net result of this potent electric field is a so-called ‘electric wind’ powerful enough to accelerate heavy ions to escape velocity, blowing them right out of the atmosphere and away from the planet’s gravitational pull. Escape Velocity Escape velocity is simply how fast an object needs to be going in order to escape the gravitational influence of a massive body. The escape velocity near the Earth’s surface, for example, is about 11 km/s so don’t expect to be able to pitch a fastball into low-earth orbit. On Venus, it was expected that hydrogen ions, which are extremely light, would be accelerated to escape velocity and blown off into space but with a field this strong even heavier ions like oxygen are carried away as well. Imagine the following scenario: water on the surface of Venus evaporates and is carried into the atmosphere, then as it reaches the upper regions the high-energy interactions from the sun ionize the water into positively charged hydrogen and oxygen ions, and finally thanks to the electric wind the ions are accelerated to escape velocity and are jettisoned into space. When water evaporates on earth it eventually condenses in the atmosphere and rains down again, but the electric wind could explain why no such thing happens on Venus. 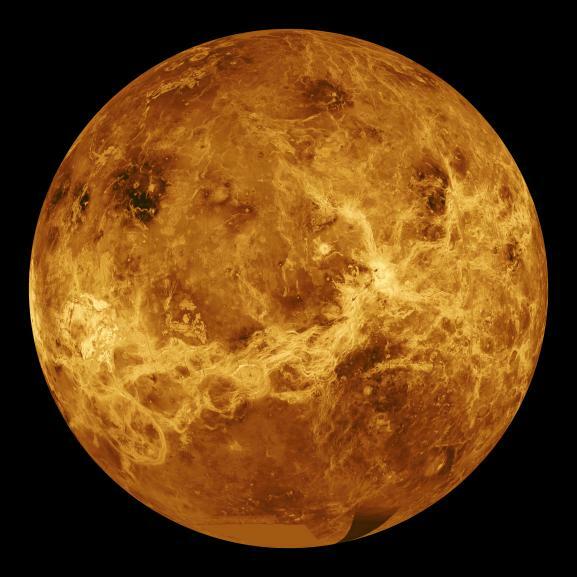 There is evidence that Venus once had liquid water in the past, yet it doesn’t today, and scientists think this could explain why. 2: How does Venus maintain its dense atmosphere? 2.1: Other planets with weak magnetic fields have weak atmospheres. Venus is a strange exception. The primary benefit of a planetary magnetic field is its ability to divert the highly energetic charged particles directed at the planet by solar winds and coronal mass ejections (CMEs), enormous bursts of plasma and EM radiation emitted by the sun. Scientists theorize that it is precisely this phenomenon that led to the disparity between Earth and planets like Mars. While the Earth has a strong magnetic field Mars has a very weak one and this may have led to Mars’ presently very thin atmosphere. This seems like a very simple dichotomy explained by sound scientific theory: planets with weak magnetic fields aren’t shielded from solar weather interactions with their atmospheres, and as a result, their atmospheres are gradually ‘blown off’ into space but this turns out not to be the case. This is where Venus becomes somewhat of an anomaly because while it lacks an intrinsic magnetic field, much like Mars does, it still retains an incredibly thick atmosphere rich in heavy gasses. Venus’ lack of an intrinsic magnetic field was first observed by the Mariner 2 spacecraft in 1962, and later by the Venus Orbiter in 1978 (Fig. 3). As was previously covered, multiple hypotheses have been proposed to explain this phenomenon including the lack of a solid inner metal core and the apparent lack of plate tectonics on Venus preventing the efficient cooling action to drive convection in the core, thereby sustaining an intrinsic magnetic field. mystery generated by this lack of a magnetic field: How does Venus maintain a thick atmosphere without the protection afforded by a magnetic field? All planets lose some amount of their atmosphere over time, and solar weather is an important factor in determining how quickly this depletion occurs. Solar wind particles carry a huge amount of kinetic energy since they travel through the solar system at speeds as high as 800 km/s, and collisions between a planet’s outer atmosphere and these particles are enough to blast the constituent gasses of an atmosphere off into space. For a planet like Mars, for which there is evidence that a thicker atmosphere existed approximately 3.5 billion years ago, this could explain why presently we see a very thin atmosphere. Venus, on the other hand has managed to keep an atmosphere so dense that atmospheric pressure at the surface reaches 90 atmospheres. That’s about 90 times more atmospheric pressure than the standard pressure at sea level on earth, or about the same pressure at a depth of 1 km in Earth’s oceans. 2.2: Why then is the Venusian atmosphere so dense? Two longstanding hypotheses. Firstly, it is hypothesized that Volcanic activity on the planet’s surface has been consistent and large-scale enough to effectively replenish Venus quickly enough to counteract the loss due to solar weather. Enormous thermal hotspots were observed by the Venus Express using thermal and ultraviolet imaging. It has long been suspected that Venus is one of the most volcanically active bodies in the solar system and while Venus Express wasn’t necessarily the first observation of this phenomenon, it was nevertheless one of the most important. Large amounts of carbon dioxide that would normally be trapped in the planet’s crust are ejected by volcanic activity effectively replenishing the atmosphere. Secondly, it has been suggested that the constituent gasses of the Venusian atmosphere are simply heavy (technically massive, since the important part is the mass of the gas particles) enough to resist being blown off by solar winds. According to Newton’s First Law of Motion, an object tends to maintain its velocity (zero or otherwise) unless acted upon by an external force. Newton’s Second Law of Motion dictates that the change in velocity (acceleration) of an object is inversely proportional to the mass of the object. Simply Put: An object with more mass is more resistant to changes in velocity brought upon it by the application of external forces. Even more simply put: the heavier something is, the harder it is to move. This is why it’s important to consider that Venus’ atmosphere is 96% carbon dioxide. The molar mass of carbon dioxide 44.01 g/mol. Compare this with Nitrogen, which makes up 78% of Earth’s atmosphere, and Oxygen, which makes up 21%, whose molar masses are 28.0134 g/mol and 31.99 g/mol respectively. This reality is born out by observation, where we can see Venus is actually losing atmosphere at a slower rate than even the Earth. These two hypotheses could go a long way in explaining how Venus manages to keep its atmosphere without an intrinsic magnetic field, but new observations by the Venus Express mission have led to an exciting new hypothesis: an induced magnetic field strong enough to imitate characteristics previously thought impossible without an intrinsic field. 2.3: A new hypothesis. Venus’ induced magnetic field isn’t what we expected. On May 15, 2006, Venus Express was crossing Venus’ magnetotail when it observed something altogether unexpected: a rotational magnetic field structure approximately 3400 km across. This structure is known as a plasmoid. The observations were made with Venus Express’ MAG magnetometer, a device that measures the strength of magnetic fields. When solar weather interacts with a planet’s ionosphere the charged particles that make up the solar wind are slowed and diverted, forming a tail of plasma and radiation that trails on the opposite side of the planet from the sun. As the tail stretches across space the magnetic field lines can meet one another and reconnect in a loop formation. This closed loop of electrically charged plasma cuts off the rest of the magnetotail, ejecting it off into space while the closed loop of plasma is attracted back towards the planet. This phenomenon is called magnetic reconnection and it was previously thought to be impossible for a planet without an intrinsic magnetic field and serves to demonstrate that Venus’ induced field is stronger and more effective at diverting solar weather than was previously understood. Continued observation of magnetic reconnection in Venus’ magnetotail was initiated by ESA using the Venus Express probe before the mission officially ended in 2014. The data collected has since been studied by astronomers and astrophysicists and has led to an increased appreciation for the role of Venus’ induced magnetic field as a mechanism for reducing atmospheric loss. Future missions to Venus, armed with this new knowledge, could focus on in-depth observations of Venus’ induced magnetic field to further assess its effect on reducing atmospheric loss. By understanding the mechanisms of Venus’ atmosphere we come to a greater understanding of our own place in the solar system. A planet so close to our own, and so similar in many ways can shed light on the mechanics of our own atmosphere. Venus has so many similarities to Earth and yet at present it is very different at the same time. The most important question is “Why?”. Venus has an extremely dense atmosphere, no plate tectonics, no intrinsic magnetosphere, a mysterious induced magnetosphere, a distinct lack of water at present despite the possible presence of water in the past. It is understood, based on the information presented, that due to specific conditions on Venus there is no intrinsic magnetic field generated internally on the planet and that this contributes to a high incidence of solar weather interactions with the Venusian ionosphere. It is also understood that these interactions form a key component in forming Venus’ magnetotail and in contributing to atmospheric loss. Despite all this, Venus maintains its dense atmosphere for a number of hypothesized reasons, including volcanic activity, its atmosphere’s composition, and the previously underestimated strength of its induced magnetic field. Only through careful study and an understanding of the natural processes can we understand what led to Venus being so different from Earth. Is it possible that Earth’s future looks like Venus’ present? Once we’re able to accurately model the various phenomena in Venus’ atmosphere and the consequences of solar wind interactions we can put those models to the test by collecting more data and comparing these to our predictions. It is this fundamental process upon which all of science is based and it enhances our understanding not just of other planets but of our own. If Venus has no plate tectonics then could this be the case in Earth’s future? If Earth is losing atmosphere faster than Venus then how long does Earth have before its atmosphere becomes thin like that of Mars? These questions are ultimately concerned with predicting the future, and it all starts with studying and understanding the present. 1. G. Schubert and K.M. Soderlund, Phys. Earth Planet. Inter. 187, 92 (2011). 2. Natural Resources Canada, Generation of the Earth’s Magnetic Field, http://www.geomag.nrcan.gc.ca/mag_fld/fld-en.php (June 12, 2018). 3. J.L. Phillips and C.T. Russell, J. Geophys. Res. 92, 2253 (1987). 4. NASA,Venus – Solar System Exploration, https://solarsystem.nasa.gov/planets/venus/in-depth/ (June 12, 2018). 5. J.W. Head, Geology 42, 95 (2013). 6. Ginger Sutula,Solar Wind Velocity, https://sohowww.nascom.nasa.gov/explore/lessons/swvelocity9_12.html (June 12, 2018). 7.NIST, Atomic Spectra Database (ver. 5.5.6), https://physics.nist.gov/PhysRefData/ASD/ionEnergy.html (June 12, 2018). 8. NASA,Earth’s Atmospheric Layers, https://www.nasa.gov/mission_pages/sunearth/science/atmosphere-layers2.html (June 12, 2018). 9. Y. Futaana, G.S. Wieser, S. Barabash, and J.G. Luhmann,Space Sci. Rev. 212, 1453 (2017). 10. ESA,The Tail of Venus and the Weak Solar Wind, http://sci.esa.int/venus-express/51315-the-tail-of-venus-and-the-weak-solar-wind/ (June 13, 2018). 11. R. Garner,‘Electric Wind’ Strips Earth-like Planets of Oceans, Atmospheres, https://www.nasa.gov/feature/goddard/2016/electric-wind-can-strip-earth-like-planets-of-oceans-atmospheres (June 14, 2018). 12. ESA,Earths Magnetic Field Provides Vital Protection, http://www.esa.int/Our_Activities/Space_Science/Cluster/Earth_s_magnetic_field_provides_vital_protection (June 14, 2018). 13. C.T. Russell, R.C. Elphic, and J.A. Slavin, J. Geophys. Res. 85, 8319 (1980). 14. NASA,The Solar Wind, https://solarscience.msfc.nasa.gov/SolarWind.shtml (June 14, 2018). 15. NASA,Past Climates, https://spacescience.arc.nasa.gov/mars-climate-modeling-group/past.html (June 14, 2018). 16. Nine Planets,Venus Facts, http://nineplanets.org/venus.html (June 6, 2018). 17. C. Gillmann and P. Tackley, J. Geophys. Res. Planets 119, 1189 (2014). 18. NASA,Newton’s Laws of Motion, https://www.grc.nasa.gov/www/k-12/airplane/newton.html (June 8, 2018). 19. Engineering Toolbox,Molecular Weight – Common Substances, https://www.engineeringtoolbox.com/molecular-weight-gas-vapor-d_1156.html (June 8, 2018). 20. ESA,Venus Compared to Earth, https://www.esa.int/Our_Activities/Space_Science/Venus_Express/Venus_compared_to_Earth (June 7, 2018). 21. ESA, A Magnetic Surprise for Venus Express, http://sci.esa.int/venus-express/50246-a-magnetic-surprise-for-venus-express/ (June 5, 2018).